We recently unveiled a significant piece of art at our main entrance, off Goodwood Road: Connections. 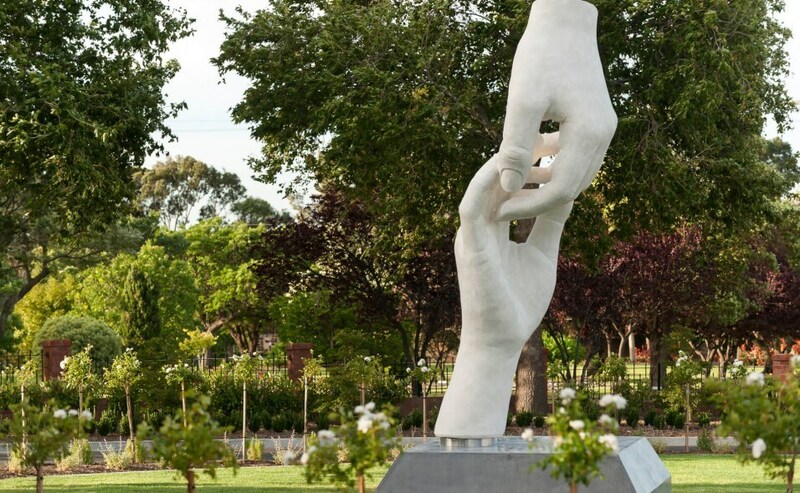 The five-metre tall sculpture aims to convey human connection, togetherness. warmth, care. friendship and support – the very essence of Centennial Park. The sculpture is visually engaging and relevant to the diverse range of our 500,000 visitors a year. Formal landscaping elements and flowering plants frame the artwork and provide a subtle interplay of colour to be enjoyed by all, including those driving along Goodwood Road. Created by South Australian artist, Karl Meyer from Exhibition Studio, winner of the Brighton Jetty Sculpture Award for Best Outdoor Sculpture, Karl is recognised for creating original works that are whimsical thought provoking and inviting of enquiry. Karl’s enthusiasm for art and design arises from engaging in the development process from the initial concept to the final object. A fascination with the evolution of ideas and how they influence people and the physical environment led Karl to study Industrial Design in the early 1990’s. Karl uses the physical form of sculpture as a medium to engage people within the environment, stirring the imagination, and giving them pause to reflect on their surroundings. Many local South Australian artists plus one interstate artist presented concepts for the major artwork, which was followed by extensive evaluation of the proposals to find the piece that would best meet Centennial Park’s vision to connect people through a rich tapestry of beautiful gardens, service, events and stories. Centennial Park is a special place for the community, a place to reflect and remember. This one of a kind main entrance artwork will welcome the community to our breathtaking gardens and spaces. We are very excited by the sheer beauty and the emotional message associated with this unique sculpture and what it expresses.